The route of the 20 km of Brussels run on 29 May will be altered to accommodate for the closed Stéphanie- and Montgomery tunnels, according to the RTBF. Carine Verstraeten, secretary general of Brussels promotion confirms the information in De Morgen. "In consultation with the police and the municipalities, we have decided to slightly change the course of the race," Verstraeten told the newspaper. "The race still starts at Cinquantenaire in the direction of the Schuman roundabout. From there the runners will take Rue Froissart instead of Rue de la Loi. They then follow Rue Belliard and Rue de Lambermont before taking a left turn onto Rue Ducale, where they meet up with the original route (Rue de la Régence, Poelaert). The runners continue above-ground past the closed Stéphanie tunnel until the Louise roundabout." From there the route continues as usual towards Bois da la Cambre via the open tunnels, following Avenue Franklin Roosevelt, Chaussée de la Hulpe, Boulevard du Souverain and back up Avenue de Tervueren towards the finish at Cinquantenaire. This year's 37th edition of the race kicks off at 10.00 on 29 May. 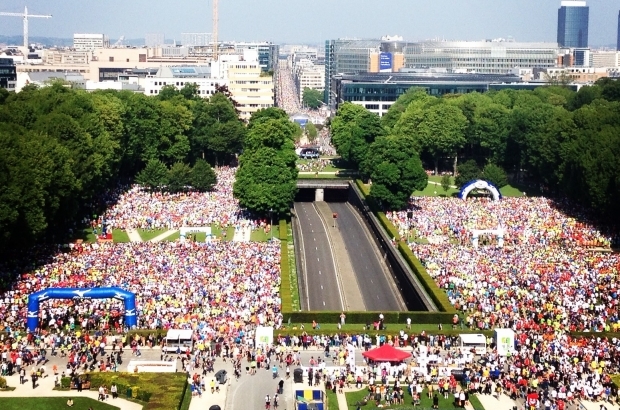 Last year, more than 40,000 people participated in the 20 km of Brussels. There were 133 nationalities represented.